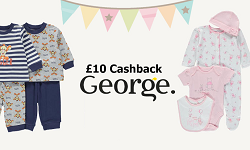 This week we’ve got a great new member deal- we’re offering £10 cashback on a £10 spend at George. The offer includes absolutely everything on the George site! All new members need to do to claim this deal is follow the steps below! Spend £10 on the George website and receive £10 free cashback! All new members have to do to claim their FREE £10 cashback at Geroge is follow these four easy steps! Click 'Get Cashback' to go through to George website and spend £10 or more as you normally would. Members can enjoy their purchase knowing they'll be recieving £10 cashback!